Can a room full of angry jurors ever reach a verdict? 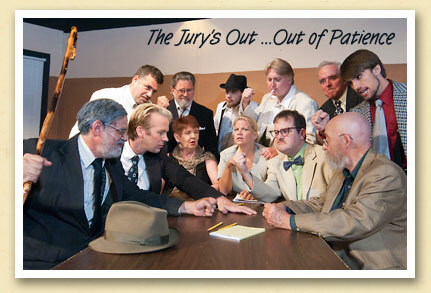 You’ll find out when you attend the Smoky Mountain Community Theatre’s current production of “Twelve Angry Jurors,” a play by Reginald Rose. Remaining performances are July 23, 24, 25, 26 at 7:30 pm. Tickets are $8 for adults, and $5 for students ages 6 to 18. Children under six are admitted free. 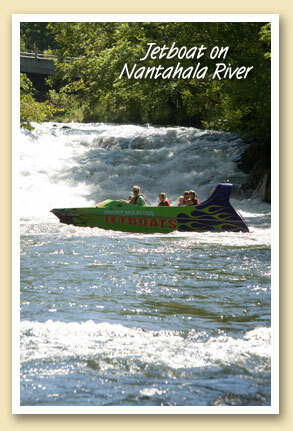 For information or reservations, contact Director Toby Allman at 828-488-8103 or 828-508-6645. The Smoky Mountain Community Theatre is just one of the entertainment options available when you visit Bryson City and the North Carolina Smokies this Summer. There’s Saturday evening music at the Depot and Stecoah Valley Cultural Arts Center; as well as programs at the Swain County Center for the Arts and the Smoky Mountain Center for the Performing Arts in nearby Franklin. You’ll find a complete schedule here. 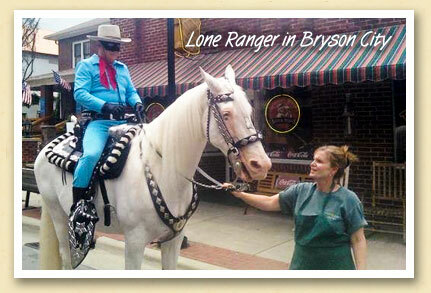 The legendary masked man returned to Bryson City last week …on a mission to protect Great Smoky Mountains Railroad passengers from marauding train robbers. 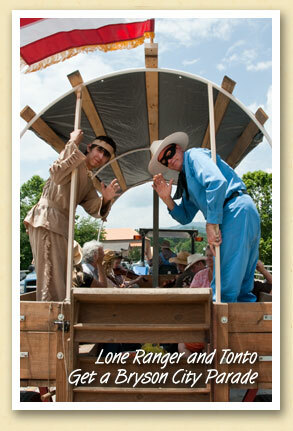 The railroad was so grateful that they threw a parade for our hero and his faithful sidekick Tonto. 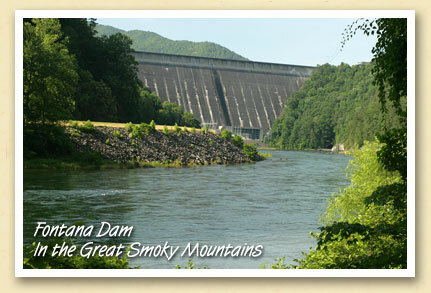 When it was completed in 1944, Fontana Dam was the fourth tallest dam in the world. And at 480 feet, the Tennessee Valley Authority dam is still the tallest in the Eastern United States, and a must-see for visitors to the Great Smoky Mountains. It’s the first of five hydroelectric dams along the Little Tennessee River. Constructed to provide additional electrical power for the war effort, the dam and the resulting 11,700-acre Fontana Lake required the purchase of 68,292 acres of land, 5125 acres of which was forested and had to be cleared. 1,311 families and 1,047 graves had to be relocated, and four Western North Carolina towns — Fontana, Bushnell, Forney, and Judson — were completely inundated. As the four towns disappeared, a new village was created to house the project’s 5,000 construction workers. Many of those structures remain today as part of the Fontana Village Resort. 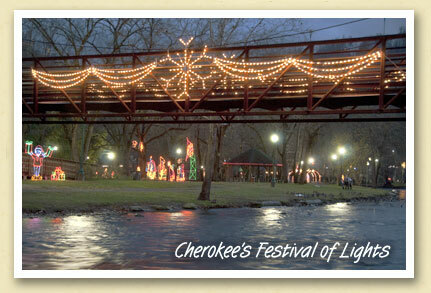 Each day at dusk, the streets of Cherokee, NC come alive with holiday lights. 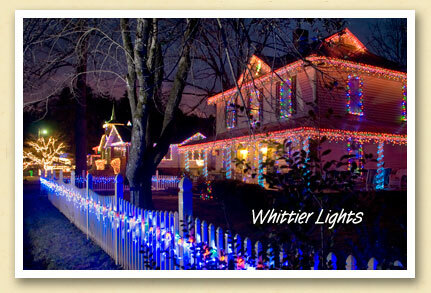 The Tribe’s annual “Festival of the Lights” features lighted, animated scenes and holiday characters throughout town. And the centerpiece of the display is Island Park, where the foot bridges are festooned with lighted garlands and the lights are reflected off the Oconaluftee River. The Festival of the Lights can be seen nightly through January 11. Christmas music is a big part of the Polar Express Train Ride experience with everyone joining in. 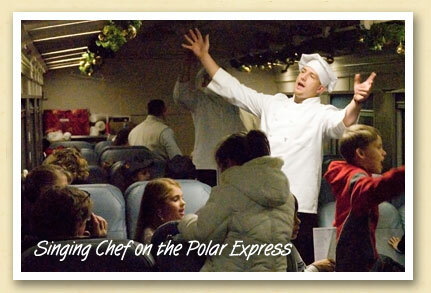 And while one might assume that the conductor would direct the singing, it’s actually the singing chefs that lead the passengers in singing familiar Christmas carols. Departing from the Bryson City train depot, the Polar Express train ride continues through Wednesday, December 23. A great holiday tradition with caroling, hot cocoa, a treat and chance to talk to Santa. More info and schedules. Nothing says “October” quite like the pumpkin. And yes, it is technically a fruit because it has seeds. And even if you carve your pumpkin into a jack-o-lantern, you can still enjoy those seeds as a tasty and nutritious snack. The shells are edible and a good source of fiber. Recipe below. 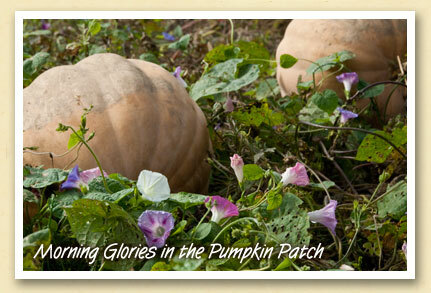 Locally-grown pumpkins are available at markets and fruit stands throughout the Smokies. 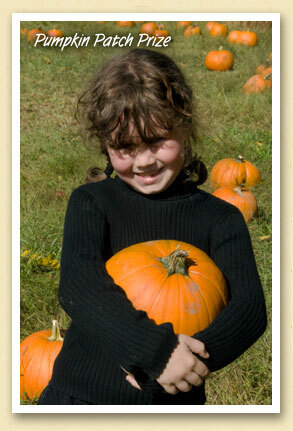 But for children, there’s an exciting way to get a pumpkin in the Smokies. They can ride a train, visit a pumpkin patch, meet Charlie Brown, Lucy and Snoopy and bring home their own pumpkin on the Great Smoky Mountains Railroad’s annual Halloween-themed excursion. “Peanuts — The Great Pumpkin Patch Express” continues weekends through October 25. Trains depart the Bryson City depot. Preheat oven to 250 degrees F. Line a baking sheet with non-stick foil. Cool pumpkin seeds before eating. Store in an airtight container at room temperature up to three months or refrigerate up to a year. Move Over Tom Hanks, I’m in Charge Here! It’s a long-standing tradition — children ride the Polar Express train in their pajamas. But not Nate Hundley. 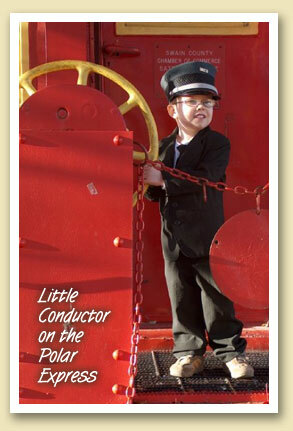 When he rode the train last year, he was the only child dressed as a conductor. According to his mom, Nate had so much fun that he now begs his parents to quit their jobs and move to Bryson City. The Polar Express train ride returns to the Great Smoky Mountains Railroad for the fifth year on November 6 and continues through December 23. Schedules and information (PDF). There was no running to the corner market for a bottle of Mrs. Butterworth. You had to grow and harvest the sugar cane, grind the stalks in a horse-powered cane mill, and boil the pulp in a wood-fired cooker …all before pouring the syrup over your pancakes. This 19th century sorghum syrup-making process will be the centerpiece of the Mountain Life Festival on September 19 at the Mountain Farm Museum, on the banks of the Oconaluftee river near Cherokee. For more than 35 years, the Great Smoky Mountain National Park’s Fall Festival has provided visitors with a glimpse into the past as they make soap, apple cider, sorghum molasses, hominy, traditional toys, music and more. The syrup making demonstration is provided by students, staff, and volunteers from Swain County High School through a cooperative agreement with Great Smoky Mountains National Park and the Great Smoky Mountains Association. 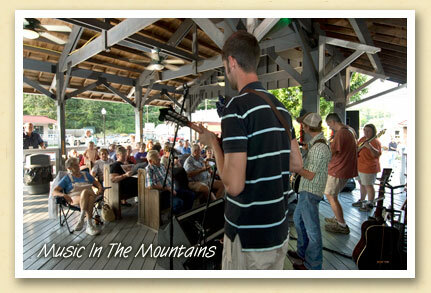 As part of the GSMNP’s 75th Anniversary, this year’s festival will include a special showcase of Appalachian folkways. Tools, farm implements and historic photographs from the Park’s archives and artifact collection will be on display to help pay tribute to the former residents who lived where the Park now stands. Music will be provided by Marshall Crowe and the Bluegrass Singers. 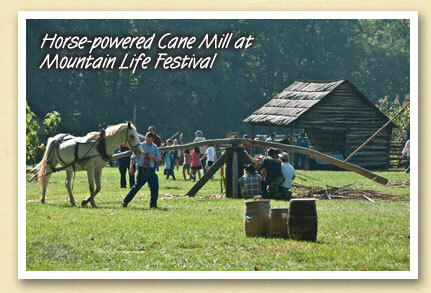 The purpose of the Mountain Life Festival is to share with park visitors some of the traditional fall activities that were an important part of rural life in the southern mountains. The spirit of cooperation that existed among families and neighbors is reflected in this event. You can view a preview in this video from the sponsoring Great Smoky Mountains Association. Ever try to throw a party an hour after the host has been murdered? 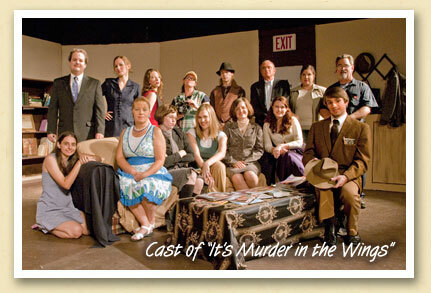 That’s the dilemma facing the Wings Publishing Company in the mystery-comedy “It’s Murder in the Wings” now on stage at the Smoky Mountain Community Theatre in Bryson City. Remaining performance dates are Friday, July 24; Saturday, July 25; Sunday, July 26; and Monday, July 27. All shows start at 7:30 PM. Ticket prices are: $8.00 for adults, $5.00 for students ages 6 to 18, and free for children under six. 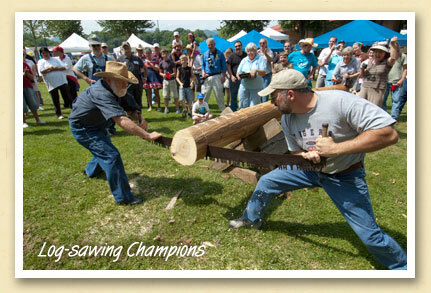 Who Will Challenge The Log-Sawing Champs? For years, the father-son team of Philip and Ronnie Lindsay have won the Swain County log-sawing championship, hands down. No one else has even come close. Will this be the year that someone comes forward to challenge them? To find out, be at the Swain County Heritage Festival, Memorial Day weekend May 23, at the Riverfront Park in Bryson City. Throughout 2009, extra attention will be focused on The Great Smoky Mountains National Park as the nation’s most visited national park celebrates its 75th Anniversary year. In the North Carolina Smokies, the anniversary season gets underway next weekend with the seasonal opening of the historic Mingus Mill. Built in 1886, the historic water-powered grist mill is just a half-mile from the Oconaluftee visitor center in Cherokee. A complete schedule of 75th anniversary events in Bryson City and surrounding North Carolina communities can be found on the Bryson City website. In addition to the official anniversary events, there’s a wealth of information on things to to in the North Carolina Smokies. Information on all 2009 events is available on the Park’s official 75th anniversary web site. Photo by J.R. vanLienden. 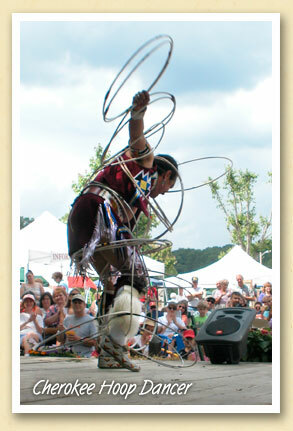 Former World Champion Hoop Dancer Eddie Swimmer performs at the annual Swain County Heritage Festival in Bryson City, NC. Held each year on the Memorial Day weekend, the festival celebrates the rich Appalachian heritage of the Great Smoky Mountains, including the area’s original inhabitants, the Cherokee Nation. Eddie uses between 36 and 42 hoops in his dance (see video), creating different arrangements of the hoops to make symbols including the eagle, turtle and butterfly. “Past generations felt it was necessary to drop the culture and heritage in order to move forward and make a living,” says Swimmer. “Now, generations want it all back. We are proud and want to bring the tradition back. Teaching people outside the culture is one way I can do that.” Read more about Eddie Swimmer on his website. As the destination of the Great Smoky Mountain Railroad’s Polar Express train ride, the town of Whittier doubles as Santa’s North Pole throughout November and December. The lights not only delight the train’s passengers, they’re a must-see for residents and visitors alike. Want to ride the Polar Express train to the North Pole? Each year, throughout November and December, the train departs from the Bryson City, NC train depot on its magical journey to the North Pole. Children are encouraged to wear pajamas to hear the story, meet Santa, enjoy caroling, hot cocoa and games. 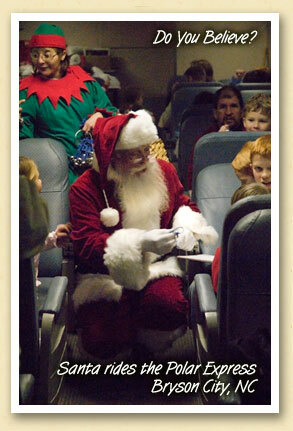 Above, Santa gives those children who “believe” a shiny bell as a momento of their train ride to the North Pole. 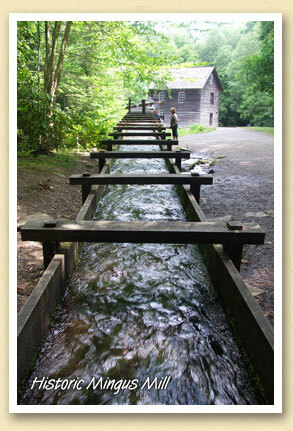 One of the most fascinating attractions in the Great Smoky Mountains National Park is Mingus Mill, the historic grist mill near the Oconaluftee Visitor Center just north of Cherokee. Built in 1886 and still producing stone-ground cornmeal, the mill uses a water-powered turbine rather than a water wheel to power its machinery. 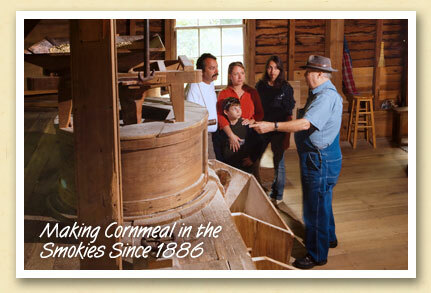 Visitors are treated to demonstrations of the corn-grinding process and may even purchase a bag of cornmeal. Open 9 to 5 daily from mid-March through mid-November. Also open Thanksgiving weekend. Photo by Jennifer Wilson. Jeanna Davis of Waynesville, NC carries home the pumpkin she picked from the Peanuts Great Pumpkin Patch last Saturday. She and her parents rode the Great Smoky Mountains Railroad’s annual “Pumpkin Patch Express” from the Bryson City depot. Aboard the excursion train, children hear the story “It’s The Great Pumpkin, Charlie Brown.” At The Great Pumpkin Patch, they meet Charlie Brown, Lucy and Snoopy, enjoy campfire marshmallows, a coloring station, temporary tattoos, trick or treating, petting zoo, bouncy train, giant hay bale maze, hay rides, bobbing for apples, apple cider or apple juice, and treats. The Peanuts Great Pumpkin Patch Express continues over the next two weekends — October 17–19 and October 24-26. For information, call 800-872-4681 or visit www.gsmr.com. 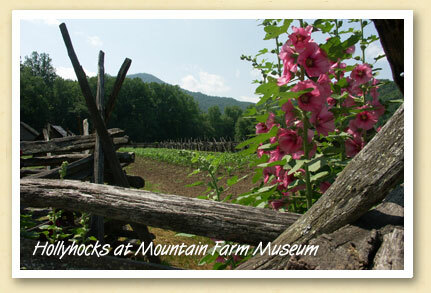 You’ll find lodging information at GreatSmokies.com.